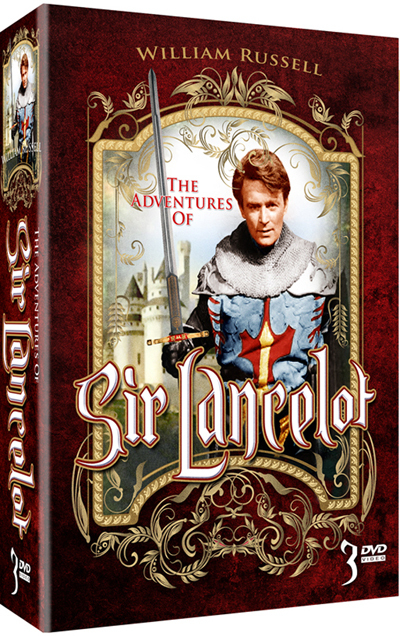 This post concludes the series of The Adventures of Sir Lancelot. The gallant Sir Lancelot played by William Russell, fights and charms his way through this series winning the hearts of many women and lending out bruises to the medieval brutes. Sapphire Films produced this series for ITC Entertainment along with some other ITC shows that will be included in this blog such as The Adventures of Robin Hood and a favourite The Buccaneers. There is a rumour that founder Hannah Weinstein received funds from the Communist Party in Hollywood and ultimately became blacklisted during the awful McCarthy era witchhunts. Being the strong woman she was known to be, she opposed the McCarthy hunts by moving to the UK and enlisting many other persecuted writers and producers in the shows that she produced for Sapphire Films. I can only commend her if only for her producing shows like this one let alone her being one of the rare women in amongst a very heavy male media industry. As far as the show, I was not personally excited about this addition to the blog simply because the shows production was obviously geared to the starry eyed young boys glimpsing into the world of knights and princesses. At times I can see the cheesy nature to the settings but kept an open mind by nearly channelling my 8 year old self. The gems to me in this series are the character actors like Derren Nesbitt whom played small roles in 14 of the 30 episodes and Nigel Green who usually played “bad guys”. The shows lead actor William Russell, known more for his role of Ian Chesterson on Dr Who, did not strike me as a Sir Lancelot but redeemed himself by showing a decent skill of sword fighting and matched with his clean good guy looks was likely the best person available for the role. Someone whom was watching an episode with me mentioned that its likely a show the young Monty Pythons would have watched on TV and served as a guide to there eventual medieval themed comedy Monty Python and the Holy Grail.